Championship level course - good length with a mix of open and wooded holes up and down the hills. Amenities near the course include a general store and beautiful views. Fee: $5/day - pay at the general store where they have scorecards and maps. Hwy 193 South to a right on W Cove Rd - runs into the property. Go along the tree lined road to the general store. Fantastic course! Beautiful scenery, a great collection of big throws that you won't find elsewhere in the area. Pros: Challenging and FUN. 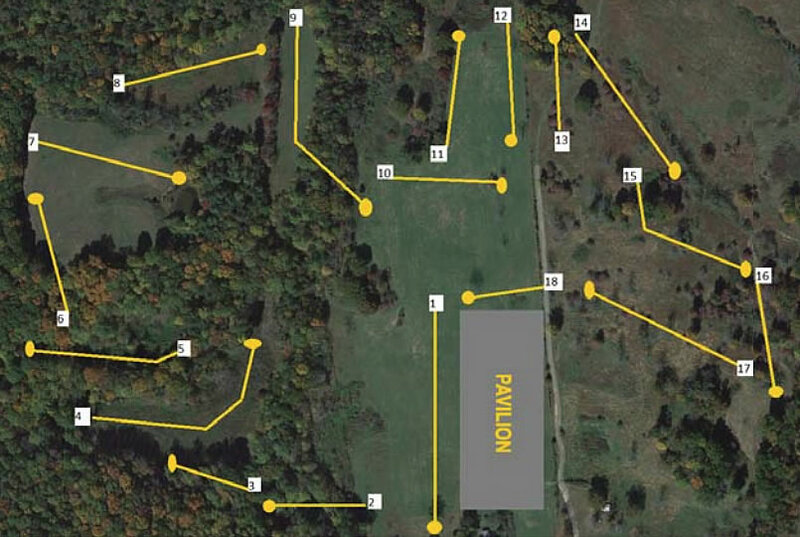 Multiple downhill throws, and plenty of opportunities to really rip on your longest discs while requiring controlled lines at the same time to stay away from some intense rough/ natural OB. Cons: The tee pads are heavy duty rubber mats that are pretty uneven at times, and slippery when wet. This makes the uphill shots especially tricky. It takes a lot of time and effort to keep the course mowed, and in the spring & summer, the grass can sometimes get unplayably long. Not always the case, but you'll want to call ahead to check on the course conditions before making the drive down there. Overall a fantastic course, and well worth a trip to get there.